If you’re a coffee aficionado, chances are that you’ve been hearing more and more about the new trend of pour over coffee. This method of brewing originated in Japan, but recently, it’s gained popularity around the rest of the world as well. It’s an easy way to create bold, flavorful coffee that’s custom crafted to meet your specific tastes. Whether you’re a new coffee enthusiast or a bit of a coffee snob, you can enjoy the taste of pour over coffee with the right equipment and just a little bit of TLC. As you may have guessed, pour over coffee is named for the way in which it’s brewed. After you’ve ground your fresh coffee beans, you use a specialized brewing system to pour hot water over your coffee grounds instead of flooding a coffee filter. This way, a precise amount of water flows through your coffee grounds for a period of several minutes to soak as much flavor out of your grounds as you like. A slower pour allows water to draw out more flavor, while a quicker pour will result in milder coffee. Unlike other brewing methods, handmaking pour over coffee gives you complete control over the strength and flavor of your drink. Pour over coffee requires both time and patience, but the end results are well worth the effort. Brewing drip coffee by hand allows you to perfect every step of the process, from grinding your beans to extracting their flavor. You can easily find the perfect balance of water and grind to make a delicious cup of coffee that’s built to meet your unique tastes. It might take a few tries before you achieve your perfect cup of pour over coffee, but don’t get discouraged. One of the most important elements in a great cup of coffee is the beans, and to get the most flavor from your beans, you’ll need a good grinder. You don’t want your grind to be too coarse, as water will flow through the coffee granules too quickly and produce a weak coffee. You also don’t want your grind to be too fine. This will slow the water down too much and over-extract flavor from grounds, producing a harsh, bitter coffee. You should aim for a consistent, medium-coarse grind. You can control size best with a burr grinder, as these create uniform coffee grounds that allow for better extraction of oils and flavors. Once you’ve got your grind just right, it’s time to start brewing your coffee. Pour over coffee may take a little bit of time to make, but the process is simple and doesn’t take much skill to perfect. Boil your water to a temperature of between 195℉ and 206℉. You can either monitor your water with a thermometer or invest in a smart kettle. Rinse your filter papers for five seconds with hot water so that your coffee doesn’t taste like paper when you drink it. Place a filter in your dripper and wet, or bloom, your coffee to get rid of excess CO₂ that may prevent water from fully penetrating your grounds. Simply add enough water to make the grounds damp and wait thirty seconds. Pour a gentle stream of hot water over the center of the grounds in your filter, then slowly work your way outwards in a spiral. The slower you pour, the stronger your coffee will taste. It might take a few tries before you achieve your perfect cup of pour over coffee, but don’t get discouraged. Once you’ve mastered the basics of the pour over method, you might just never go back to your French Press or espresso machine. 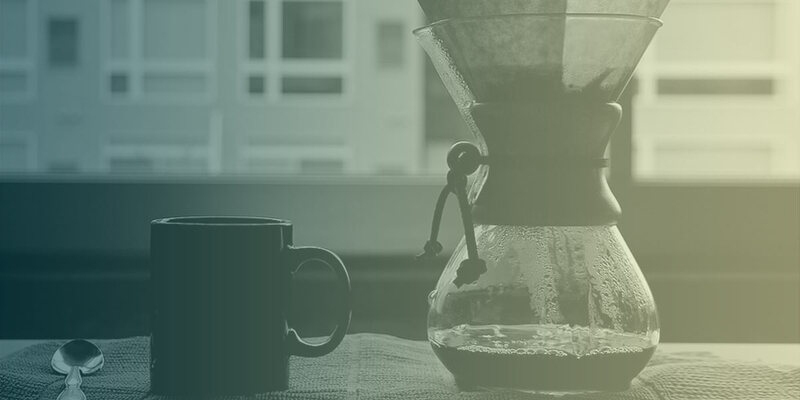 When you’re thinking about buying a pour over coffee maker, there are some important factors to take into consideration, such as size, price, ease of use, and more. If you plan to travel with your coffee maker or take it back and forth from work, you may want to consider portable models. Conversely, if you plan on creating an elaborate setup for your home coffee bar, you may want to look into full kits that contain everything you need for the perfect cup of pour over coffee, from drippers to filters. Hario v60: It’s hard to beat the Hario in terms of quality. This Japanese coffee dripper is available in a variety of colors and materials, including glass, ceramic, plastic and metal. Its conical design includes spiraled inner walls, which help to ensure more even coverage when you’re watering your grounds. The Hario also comes with specially made filters that fit snugly inside the dripper. Chemex: The Chemex is an all-in-one solution for coffee enthusiasts who want to brew their very own pour over coffee at home. The design seamlessly blends style and functionality to create an appealing coffee maker that brews a mean cup of joe. Chemex filters are specially designed to keep out bitter oils and slow the flow of water, resulting in a more flavorful beverage. Bodum Pour Over Coffee Maker: If you’re looking for a coffee maker to use at home, in the office, or in your college dorm, then the Bodum just might be for you. The portable design includes a permanent stainless steel mesh filter that won’t trap essential oils, and it can be reused time and time again so that you don’t have to spend money on new paper filters each month. Melitta Pour Over Brewer: This incredibly durable little coffee maker includes everything that you need for the perfect caffeine break, no matter where you are. A stainless-steel carafe keeps coffee warm while you commute, while a heavy-duty plastic lid prevents anything from spilling out. You’ve got the beans, you’ve got the dripper, you’ve got the carafe- now what? Filters: When making coffee, a filter is essential to keeping unwanted grounds out of your drink. Many are made of paper, and you can find different sizes to fit your dripper. Kettle: The right kettle is arguably just as important as a dripper when it comes to making pour over coffee. It’s best to look for a gooseneck kettle, as it will produce an even stream of water that’s easy to control. Stand: If you don’t want to hold your dripper as your coffee brews, you should probably invest in a pour over coffee stand. The stand holds your dripper steady above your cup or carafe, leaving you free to concentrate on even pouring. You can find basic stands, or decorative stands designed to make a statement. So Why Brew Pour Over Coffee? Pour over coffee is not only delicious, but it’s also easy to make in the comfort of your own home if you have the right equipment. While pour over brewing may be a relatively slow process, it gives you optimal control over the taste of your drink. Whether you prefer light and mild or heavy and bitter, you can get your cup of joe just right by using the pour over coffee method. If you want to learn more about pour over coffee, sign up to my email list to receive The Ultimate Coffee Gear Guide eBook for free.